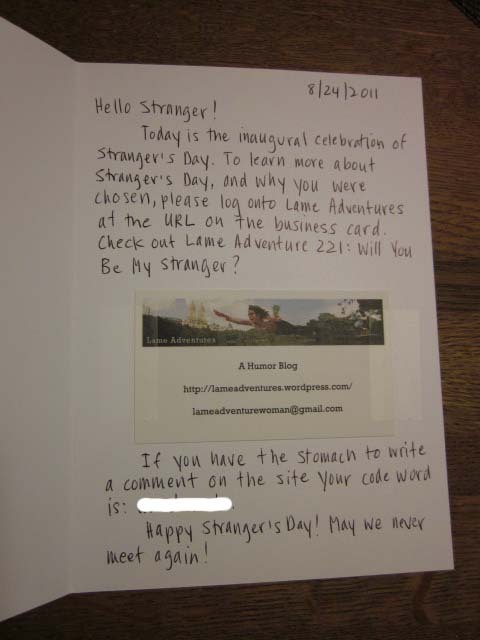 Lame Adventure 221: Will You Be My Stranger? 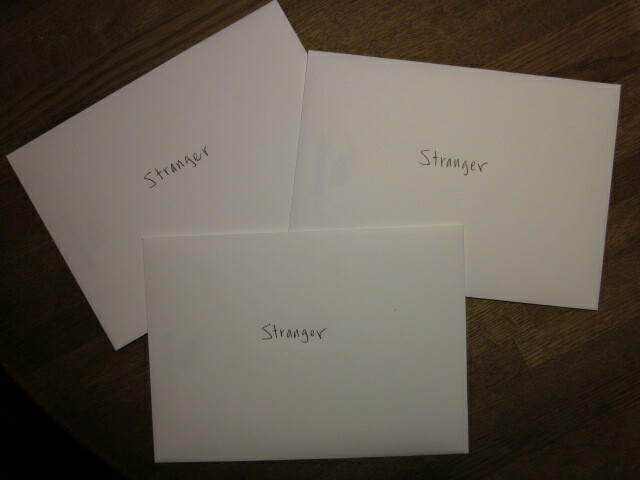 You: What the hell is Stranger’s Day? According to Roz, this is the holiday where we acknowledge the billions of random Joes and Joettes out there that we don’t know, don’t care about, that neither know nor care about us! What symmetry! What simplicity! What a middle finger to the oozing sap that’s Valentine’s Day! Then, I resumed crunching numbers at my desk and fighting a coma until a light bulb blew out over my head. It dawned on me that maybe the kindred needy spirits of Café Press would cut me a break on shipping if I praised them all out of proportion on my blog. I phoned Café Press’s call center in Mississippi and I got through to Synetra the Wonderful. Following is an edited version of our exchange. Synetra: Café Press. This is Synetra. 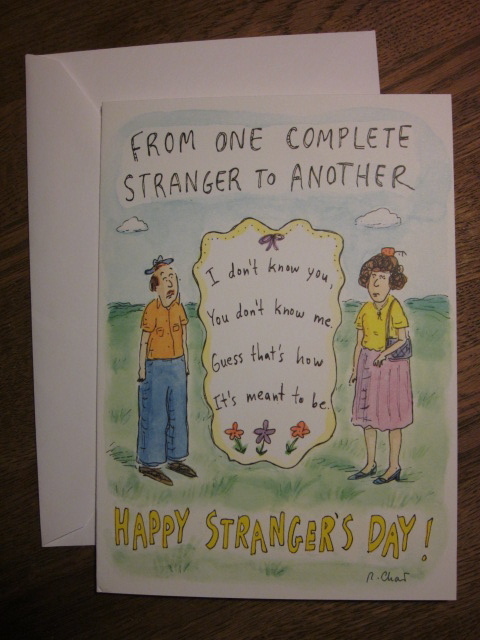 Me: Hi, are you familiar with the Stranger’s Day cards on your web site? 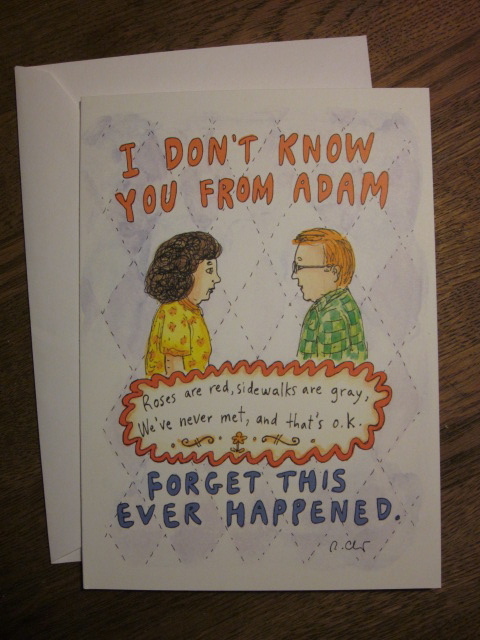 Me: Are you familiar with the cartoonist Roz Chast? Me: Are you familiar with The New Yorker magazine? 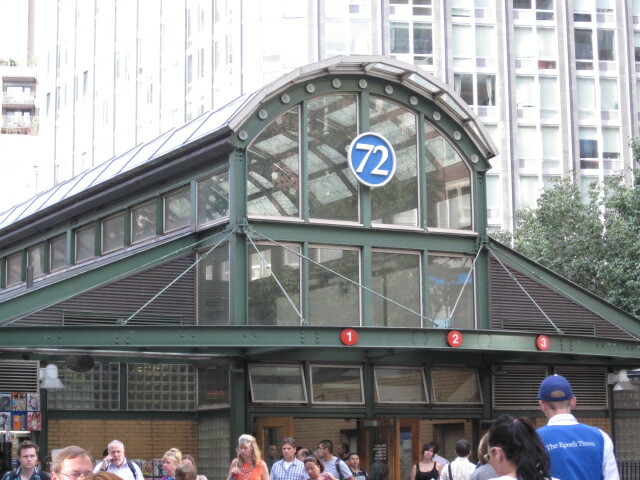 It’s been around since 1925, it remains very popular and it’s still profitable. Synetra: I think I’ve heard of them, ma’am. Synetra: When your order ships, the $31 in shipping charges will be deleted, ma’am. Café Press and Synetra the Wonderful, you rock! Someone that does not look like they’re carrying a concealed weapon. Someone that does not look like they’ll yell at me or beat me up. Someone that smells good or is unscented. Someone that looks like they know how to read (preferably The New Yorker). And of course, someone I don’t know that doesn’t know me that I’ll never see again. If you were one of my three strangers, how strange was this? If you take the time to comment here, remember to mention your code word so I know that you are you and not someone that thinks they can punk me. 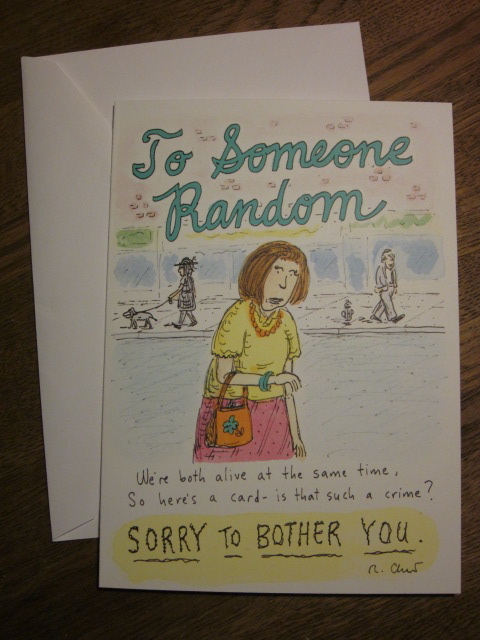 If I threw up a little when I handed you your card, I hope it was not on your attire, and I apologize profusely. Will any of these chosen Strangers respond?